Reviewed by Philip Graham. Kurt Vonnegut was, until recently, my personal Leo Tolstoy. By that I mean that I knew his name, I knew he was a famed author, and I knew that I really should have read more, or even some, of his work. So finally I went out and got "The Sirens of Titan". I chose this book over his more popular books, such as "Slaughter-House Five", because the blurb caught me instantly. Any story that apparently involves a spacecraft flying "into a chrono-synclastic infundibulum" sounds just right for me. I have very little idea what those words really mean, but they sound very exciting. The story follows Malachi Constant, the richest man in America in the 22nd century, and his adventures across the stars, travelling to Mars, Mercury and, as the name suggests, to Saturn’s largest moon Titan. Once on the moon he meets the man responsible for a large amount of the events to befall him, Winston Niles Rumfoord. Together they fly into aforementioned "chrono-synclastic infundibulum" and dematerialize, only to re-emerge on an Earth-like planet, where more bizarre and amazing events unfold, including Rumfoord establishing a church and both Constant and Rumfoord meeting a robotic space traveler, who at one point disassembles himself, only for Constant to eventually rebuild him. You don’t have to have read Vonnegut before to fully grasp his concepts, but it may take a few reads before you truly appreciate the way that the narrative is pieced together. I'm sure most sci-fi veterans know well enough to trust him when he talks about "wave phenomena" or space ships powered by the "Universal Will to Become", but by the end of the book, whether you initially understood or not, you are still left with the feeling that you understand perfectly why the events have unfolded like they have. You also don’t have to have read Vonnegut before to really appreciate the brilliance of his satire. Something like the "Church of God the Utterly Indifferent" is humorous whether you’ve read "Cat's Cradle" or not. The thing about the way the book is written is the almost relaxed way in which it's done. As mentioned before, Vonnegut offers some rather extravagant concepts for the reader, but they are presented in such a casual way that you allow yourself to just accept his truths and go along for the ride, which to me indicates the touch of a brilliant author. I don’t really know if there is anything I can say about Kurt Vonnegut or "The Sirens of Titan" that hasn't already been said in a far more professional way. I know I can say that I whole-heartedly recommend the book, and I can say that I only wish I’d picked up a Vonnegut book much sooner. 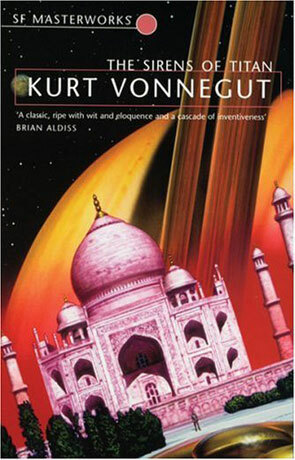 I think the most important thing I can say is that Kurt Vonnegut is a true legend of science fiction, just like H.G Wells or Arthur C. Clarke, and that whether it be this book, or any of his others, he is definitely worth reading. Written on 28th March 2012 by Philip.